The Land Rover has been in service with the UK Military for decades, usually used for transport and of men and supplies, either onboard or towed behind. The SAS pioneered the use of the Land Rover as a mobile weapons platform. The SAS had used jeeps to shoot up German aircraft parked on remote desert airstrips during World War 2. Post War, they eventually graduated to the new Land Rovers. Mobility Troop perfected the art of adapting the utility vehicles into long range patrol and attack vehicles. The concept was proved in 1991 when the SAS drove several heavily-armed Land Rover columns behind Iraq lines during operation desert storm. In 1999 Ricardo Vehicle Engineering, under contract to the MoD, produced the first WMIK variant of Land Rover's popular Land Rover 110 series. The WMIK (Weapons Mount Installation Kit) was based on the military version of the 110, the Truck Utility Medium (TUM). The WMIK featured a strengthend chasis, a roll bar cage and a series of weapons mounts. In the run up to Operation Telic, Iraq, Members of Recce Troop, 40 Commando Royal Marines fire GPMGs mounted on WMIK Land Rovers on the deck of HMS Ocean. The WMIK was designed as a reconnaissance and fire support vehicle. Mounts for various weapons systems allow the WMIK to be armed in a range of configurations. the rear roll bar cage features a well in which a gunner can stand and swing his weapon in a 360 degree arc of fire around on a rail. The rear station can be fitted with an .50 cal HMG, a 40mm GMG grenade launcher or a 7.62mm GPMG. A Milan missile launcher can also be attached to the rear roll bars. the passenger side (usually the vehicle commander's station) has a pintle-mount where a GPMG is usually fitted. A British Army WMIK Land Rover on patrol in Iraq, 2006. 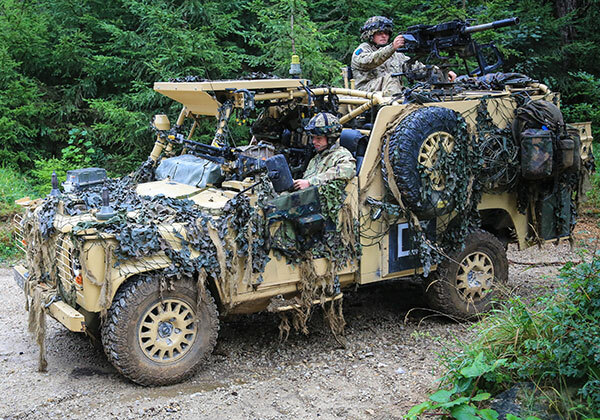 Land Rover WMIKs have been used by UK forces in a range of operations. The Pathfinder Platoon were seen driving WMIK during NATO peacekeeping duties in Macedonia, 1999. WMIKs operated by the Royal Irish Rangers were captured by rebels in Sierra Leone, along with 11 Rangers. Both the men and WMIKs were later rescued by the SAS, SBS and Paras in Operation Barras. The Royal Marines used WMIKs during assaults on Iraqi-held cities and towns of Southern Iraq during Operation Telic, 2003. Paras from the Pathfinder Platoon carried out recon and offensive operations across the Iraqi border during Operation Telic, 2003. Both the Royal Marines Brigade Patrol Troop and the PARA's Pathfinder Platoon have used the WMIKs as for recon and assault operations in Afghanistan. The Land Rover WMIKs were lightly armoured and several were shot up and disabled by small arms fire in operations in Afghanistan. They also provided little to no protection against IEDs. The ballistic protection on some WMIKs were augmented with the use of Kevlar flaps across the more vulnerable points. Another problem with the WMIK was that it's narrow wheels could cause it struggle to transverse some of the off-road ground found in Afghanistan. Further upgrades to the WMIK platform came in the form of the Revised Weapons Mount Installation Kit (RWMIK) vehicle. This model boasted more improvements to the vehicle's armour - this time built into the chasis rather than as a bolt-on addition, as was the case with the EWMIK. RMWIKs were configured with a standard BOWMAN radio fitment. The RWMIK began being deployed in 2009. Gunners from B Flight, 27 Squadron, RAF Regiment patrol in a RWMIK Land Rover near Kandahar Airfield, Afghanistan, January 2010. The RWMIKs had armoured bases to protect against mines. note the MAPIK strap-on armour kits covering rear upper body and a kevlar panel fitted across the commander's doorway. The RWMIK+ boasts a further enlargement to 4.7 tonnes GVW. It features seating for a 4-man crew, new rear axle, a 2.8-litre engine with automatic transmission, armoured doors and upper body panels and increased rollover protection (this includes fixing the vehicle commander's seat height and raising the rollbar height so the commander is always within rollbar protection in the case of a vehicle rollover). RWMIK+ vehicles were delivered by Ricardo to the MoD between June 2010 and July 2011. Soldiers with Bravo Company, 1st Battalion, Royal Irish Regiment, pictured aboard a RWMIK+ Land Rover, August 2015. The RWIMK+ is protected by lightweight, hard armoured panels. 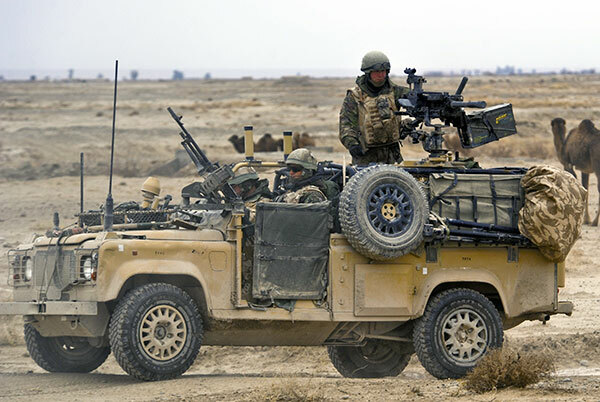 While the various upgrades were some improvement, British forces in Afghanistan gradually started employing better-protected vehicles in the recce, fire support and convoy protection roles. These vehicles, which were specifically designed to protect against mines and IEDs, included the MWMIK Jackal and Jackal 2.